Not an orchid. But unquestionably a stunner. And if the bell shaped flowers remind you a little of Pieris or Vaccinium, congratulations; it is a member of the blueberry/Rhododenron family, the Ericaceae. 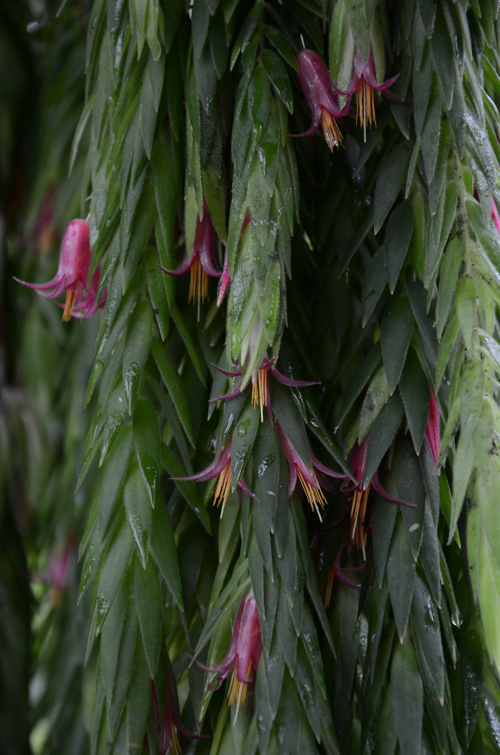 Meet Ceratostema (se-RA-toh-stem-uh) rauhii, an epiphytic shrub native to Peru. The stems are long and pendant and cloaked with adorably downy, almost succulent, leaves. (Yet another plant that is pettable. Everybody seems to want to stroke this plant.) And in spring it is studded with mauve flowers. You can see two plants on display in the Tropical High Elevation House. Ceratostema rauhii is not cold hardy in Atlanta. Our plants have done well in an intermediate greenhouse and in our chillier High Elevation House. The current year's growth is easy to root in about eight weeks under mist in a cutting mix of 3 parts perlite: 1 part peat moss. I have used Rootone and a 10% solution of Dip 'n Grow successfully. We grow our plants in slatted cedar hanging baskets in an epiphytic mix consisting of milled sphagnum, fine fir bark, charcoal and tree fern fiber. The tropical blueberries are gorgeous. More pics of our collection here, there and elsewhere. They are on display year round in the Tropical High Elevation House.